• How would pro football treat a Pete Rose story? Rose was not reinstated to baseball Monday by commissioner Rob Manfred. In effect, Rose remains on the outside looking in, with no chance (as of now) to be eligible for a job with a baseball team or to be elected the Baseball Hall of Fame. A few people asked me Monday how a player with a case such as Rose would be treated in football, with respect to the Pro Football Hall of Fame. So, voters for football’s shrine (I am one of 46) have a different task than the baseball voters. In football, the bylaws say that Hall of Fame voters must take into account only the factors that affect performance on the field. So with Rose, the vote on him as a player would be contingent only on what happened as a player—not as a manager, and not as the manager/gambler. So it seems pretty clear: If he were proposed for election as a player, Rose, in football, would likely get into the Hall of Fame, because it would be based on what he did on the field, and nothing more. •​ ​A terrific cornerback, Cleveland’s Joe Haden, went on IR for the year with a concussion, and there is a lesson in this for all of us. I documented the last play of Haden’s season in my Carson Palmer/game plan series last month. It was a touchdown pass along the right sideline from Palmer to Michael Floyd. If you read the series, you recall the circumstances: Floyd went to coach Bruce Arians and said he thought Haden wasn’t right—he thought it was a hamstring, which it may have been—and said he could beat Haden cleanly. Arians called a “go” to Floyd along the right sideline, on Haden, and the resulting long touchdown was a keystone in Arizona’s 34-20 win. Haden didn’t look hurt as he jogged to the sidelines. But that was 44 days ago, and he said Monday, “We’ve all learned how important it is to be very thorough with concussions … Although I haven’t been able to clear [concussion] protocol, the specialists I have met with told me they expect a full recovery.” My point: In doing that story, I looked at both the NFL Game Pass TV copy and the game tape of the play, maybe 10 times in all. The play that was Haden’s last was a play you see 100 times every week: a player lunging and falling to try to make a play, and landing on the ground, and you cannot see a direct head-to-ground, or helmet-to-helmet, hit of any consequence. Just goes to show players have to be monitored closely, and the concussion spotters have to be extra vigilant, even when they don’t see an obvious violent collision. Haden’s a great player, a cornerstone of the Browns. The fact that he’s still in the concussion protocol 44 days after leaving the field with what no one could know was a serious head injury has to tell everyone in the NFL that concussions are a complicated issue, and should be treated as such. •​ ​What will the Jets do with Muhammad Wilkerson? The Jets’ hugely talented 3-4 defensive end, Muhammad Wilkerson, just had a Watt-like game against the Titans and mobile quarterback Marcus Mariota: three sacks (for a loss of 27 yards), two tackles for loss, a pass defensed and a forced fumble. He’s the kind of player who can play wide in a 3-4 defense, or inside in a 4-3, and he can play the pass and the run with equal efficiency. Question is, will the Jets find some common ground with Wilkerson, their best defensive player, so he can be a Joe Klecko-type all-time Jet. I talked to Wilkerson on Sunday night, and make no mistake: He wants to stay in New Jersey, where he is from. But he has used this season of not being signed as a spur to play at his peak. “I don’t think about it very much, because I am focused on doing everything I can to help this team win,” Wilkerson said. “But I just use it as motivation. I understand it’s just business, and I’m not going to be a distraction for my team.” Wilkerson said his goal this year was to be more consistent under new coach Todd Bowles, and there’s little question he has been. On a defense with Darrelle Revis and David Harris, he’s clearly become the most valuable defender—and if he gets to the open market, which is unlikely, he’ll be the most valuable free-agent in 2016. •​ ​A player I really admire. Philip Rivers may be playing his final game in San Diego on Sunday. The Dolphins visit, and then the NFL will determine whether to allow the Spanos family to move 104 miles north to Carson. But Rivers should be appreciated now and forever by people who love football, wherever they live. On the last drive of a windswept, rainy game in Kansas City on Sunday, Rivers converted a fourth-and-three with 77 seconds left, a fourth-and-10 with 43 seconds left, and a fourth-and-10 with 16 seconds left … only to have a perfectly thrown ball missed in the end zone by the normally sure-handed Danny Woodhead with two seconds left. It’s another loss in an awful season for the Chargers, but what Rivers did—and what he has done since being drafted in 2004—deserves praise and appreciation, regardless of the Chargers’ futility. 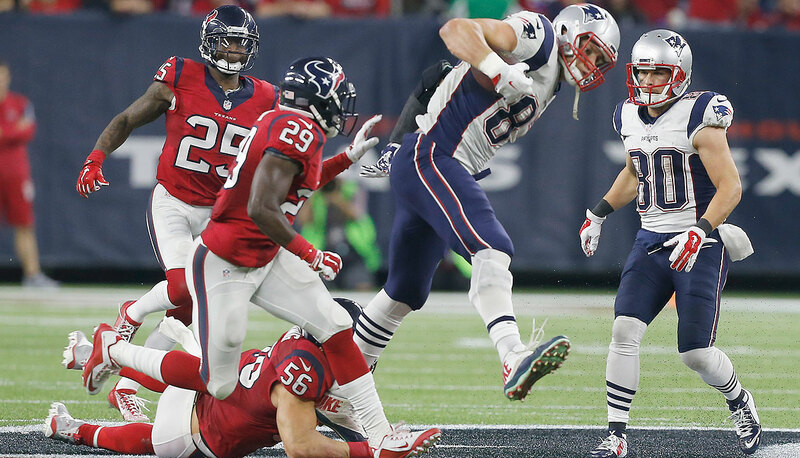 The Patriots are a whole different animal when Rob Gronkowski is healthy. 1. Carolina (13-0). Last week: 1. Deep down, I think Ron Rivera wants to drive hard for 16-0. The pragmatic side of Rivera might win out and rest guys when the top seed is clinched … but I hope not. 2. New England (11-2). LW: 7. With Gronk playing, and even with Dont’a Hightower sitting, New England’s the second-best team in football. And maybe the first, when Julian Edelman and Hightower return. 3. Arizona (11-2). LW: 3. Great acid test for the Cards on Sunday night at Philadelphia. This is the kind of game Carson Palmer’s going to have to win in January on the first weekend of the playoffs for Arizona—only the playoff game will be at home. 4. Seattle (8-5). LW: 5. Seattle and Arizona, three or four. Had to flip a coin for that one. Very close. It’ll be interesting to see how each side plays it when Week 17, Seahawks at Cards, rolls around. 5. Pittsburgh (8-5). LW: 6. I love the Denver D. But to win Sunday against the red-hot Steelers, Chris Harris and Aqib Talib are going to have to play the game of the year. 6. Denver (10-3). LW: 2. Gary Kubiak will talk to Peyton Manning, watch him practice, watch Brock Osweiler practice, and then decide who plays in Pittsburgh. What a novel concept! Playing the best guy! It’s very likely to be Osweiler, but two weeks from now—that’s the time you should be watching for Manning. 7. Green Bay (9-4). LW: 9. I never would have thought Green Bay at Oakland would be a dangerous game for the Packers in Week 15, but it is. And Khalil Mack could make life miserable for Aaron Rodgers, playing a few miles from his college campus. 8. Kansas City (8-5). LW: 8. Just run, Andy Reid. Just run. 9. Cincinnati (10-3). LW: 4. If AJ McCarron cannot win at the Niners on Sunday, you’ve got the wrong backup quarterback to Andy Dalton—and there’s a legit chance the Bengals will be playing as a wild card, not a division titleist. 10. New York Jets (8-5). LW: 12. I do not want to play that defense right now. And all those who had Ryan Fitzpatrick with a plus-14 TD-to-pick differential in December, well, sorry. I think you’re lying. 11. Minnesota (8-5). LW: 10. Teddy, Teddy. Be smarter in the pocket. 12. Philadelphia (6-7). LW: 14. Sam Bradford has thrown one pick in his past four games. Maybe the Chip Kelly ethos is correct. That ethos: Be patient; a good quarterback’s going to be good, except probably not overnight. 13. Washington (6-7). LW: 20. Passer rating for Kirk Cousins is higher than 100 in five of his past seven games. Every metric is pointing up for the guy, and Washington GM Scot McCloughan knows he has to sign him. 14. Tampa Bay (6-7). LW: 11. So the Bucs aren’t making the playoffs. No big deal. No one thought they would. This year was about the indoctrination of Jameis Winston to the pro game, and it’s gone well. 15. Buffalo (6-7). LW: 13. Wah wah wah. That’s 124 accepted penalties in 13 games for the Bills, which is outrageous. The owner is not firing Rex Ryan, nor should he. But if Rex Ryan doesn’t enter the offseason with penalty reduction as one of his top priorities, then he’s not a smart coach. 16. New York Giants (6-7). LW: 17. I don’t care that they won. The Giants’ defensive pressure stinks, and will doom them. 17. Jacksonville (5-8). LW: unranked. Amazing. Jags are in it. And Jags are dangerous. 18. Oakland (6-7). LW: unranked. Best team Raiders have had since the Gruden days. Vacant. I can’t bring myself to pick another team, let alone two.